It is almost St. Patrick's Day! It is also the birthday of "Patty" my next sister up. My parents got real original with that didn't they? When I asked my mom what they would have called her if they hadn't named her Patty, her reply was "Pat". I give up. I guess she knew all along she would be born on St. Patty's Day OR after 8 kids she would have named us anything to have it over with. Anyway, an early Happy Birthday to her, another year older than I am, must be hard to accept. Knowing how this holiday is centered around beer... Oh, what...it isn't for you? Oh. Well. Um. Well, let's just say most people at least THINK of beer on this day right? I mean, come on, even the little leprechaun at the end of the rainbow has a mug of beer, so don't judge! There isn't GOLD in that pot people, I am here to tell you, there is BEER in that pot!! Anyway, I wanted to do a recipe you could involve your kids in for the holiday! When I first lived in New Jersey, I taught Pre-K. I had only taught older kids, and I was freaking out, and had no idea how I would survive. This is around the time I was getting very into cooking and decided to do lots of it with my students. A teacher across the way from me was telling me about making Irish Potatoes with her kids. She talked about it for 2 weeks, and assuming I knew they were some kind of potato I just didn't feel the need to question what it was any further. When the day came, they delivered some extras to our classroom and I was dumbfounded. (That is such an older generation word isn't it? My mom would be proud. Almost as proud as if I answered the phone "YELLO?" or concluded each call with "Okey Dokey". My poor mom.) Sorry got off topic. Shocking eh? 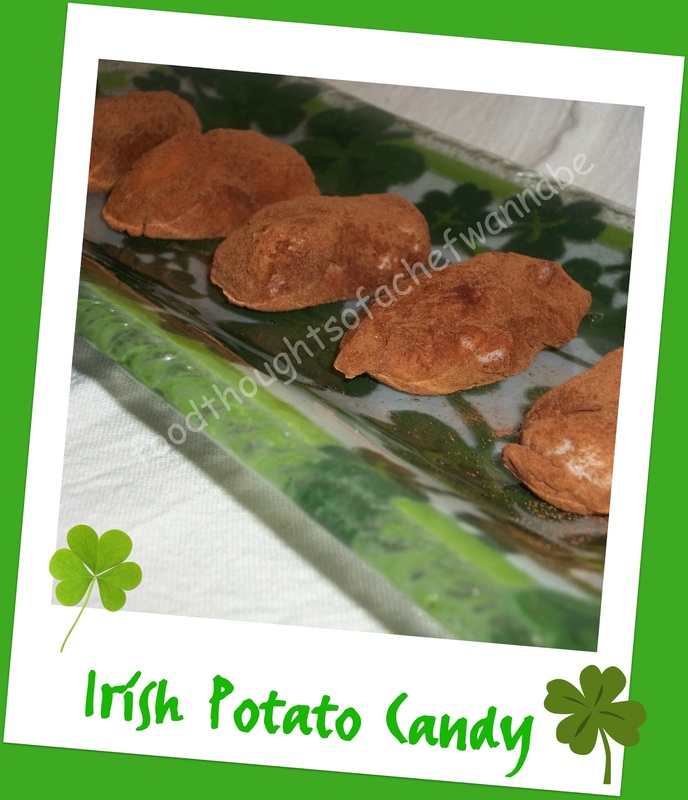 Anyway the Irish Potatoes were candy like treats, so from that year on, my kids always made them! They are extremely easy, and like I said, a good chance to get your kids into the kitchen with you. Now my husband in his manhood says, "those look like dog poop". So, excuse their "appearance". But I still say the look just as they should, like little potatoes. Just don't show the photo to your children. Or do, and tell them that is what it is and they are going to eat it for dinner! Mwaahahha! He is still trying to convince me to rephotograph them without the 2 having "pointy" ends. Now I am leaving it on purpose! Here we go! This recipe should make about 24 bite size potatoes or..ya know, turds. Combine all ingredients. Make sure butter and cream cheese are soft! Mix in coconut last if you choose to use it. *ick*. I kind of used 2 spoons to "plop" a bite size amount out on a plate. I didn't form them until I had dropped them into the cinnamon and then kind of formed them as I rolled them around. Place in a container with a lid and refrigerate or freeze until ready to serve. They are delicious and I always make them for dessert the night I make corned beef and cabbage!! Get your kids in the kitchen! They are far more likely to try things that they help make! When your child says to you, "Mom/Dad, do I like this" about any food, always say YES or I think you DO/WILL! I go crazy when I hear a child say that and the parent says, "No you won't like that". ACCKK! Nothing like teaching your kids to not try things from an early age!!! Enjoy quality time in the kitchen and enjoy these little bite size treats! Oh you are so sweet!! I miss NJ too. We lived in the Vineland area, about 30 min out of Philly. I hope you try these and let me know how you like them!! Thank you for your support and kind, encouraging words!! Your Irish Potato Candy looks amazing! So glad I found your blog (oh and thanks for the shout out on facebook!) I'm going to have a lot of fun following your adventures!